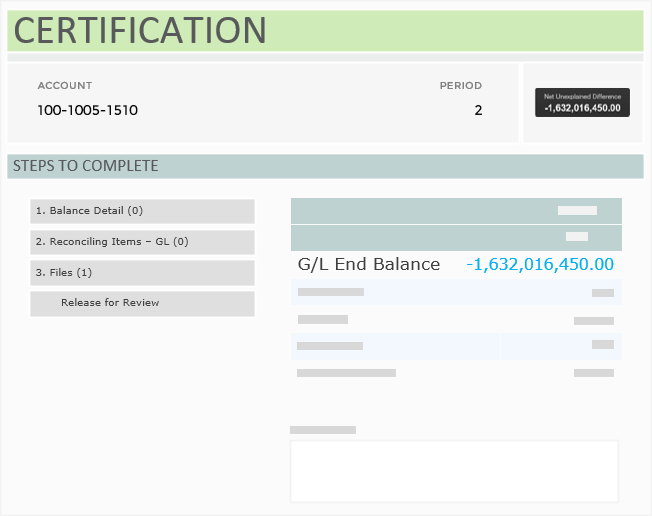 Certification is all about certifying balances. In this microcourse, we'll just show you the different places where you'll see them. When preparing an account reconciliation, you typically have an expected GL balance in mind—and you'll compare that amount against Certification's imported period-end balance. This ensures the accuracy of the GL. NOTE: Giving visibility and oversight, a SOX-driven application in the US, Certification helps you ensure the accuracy of the GL at a corporate level. Where do the balances come from? Certification, while not a consolidation tool, can take balances from any number of ERPs to centralize your reconciliation process. While the Balance Import process is entirely automated there are exceptions where you would key in the balance directly to a reconciliation (e.g. a Bank or Subledger account). Balances can be found in four places. Watch the video to learn where! Match the phrase or word on the left to its description on the right. Where I organize my work! Similar to an excel cover sheet. To see group member (child account) balances. 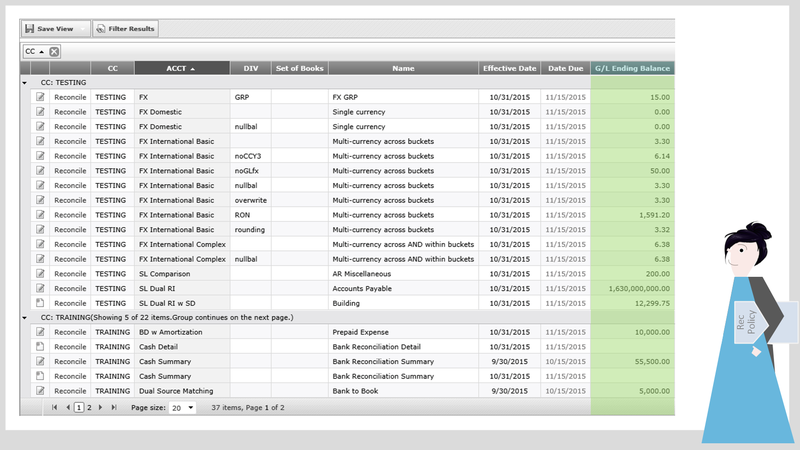 Filterable fields available, including additional reporting buckets for multicurrency reconciliations. These occur early in the reconciliation period if an adjustment is made to one of your accounts. The adjusted balance is immediately reflected in the reconciliation. Another instance of a balance update is when reconciling a group account, and your group account has a new child account added to it. What if I've already certified my reconciliation? If an adjusted account balance comes into the system, that account's month-end reconciliation will automatically decertify, and an email alert will ask that you re-certify the new balance. What if I already certified my reconciliation? Balance Updates occur when there is a change or an adjustment to an account balance. Balance Updates occur when a new child account is added to my group. I'll be notified if my reconciliation is decertified due to a Balance Update. Balance Updates can only occur after my account is fully certified/reconciled. Select all correct statements regarding Balance Updates. Balances are imported automatically but you may be expected to enter balances for certain accounts. Balance decertifications are automatic and will always notify you straight away! The application doesn't prevent you from starting a rec without a balance. Just be sure to wait until balances are imported before certifying your rec. Certifying balances is a part of SOX compliance and ensures an organization's balance sheet is accurate. Balance Updates are automatic, happen when a change/adjustment occurs to your account balance or if a new child account is added to a group reconciliation. If an account is already certified, it will be decertified and you'll be notified. We really didn't get into multi-currency in this course, but it's when an account balance is reported in two or three ways (for instance, Globally, Locally, or at the Transactional level). Multi-currency and Foreign Exchange (FX) will be covered elsewhere. One other note about decerts, you'll be notified every 6 hours to get in there and recertify -- just a warning! Only accounts authorized by administration can have their balances keyed in manually or edited. By default, this is not enabled.